The year 2014 is very important for employment law. The current laws were introduced in the mid-1990s, so with it being nearly 20 years later, it stands to reason the UK government would be looking to change employment laws to meet current requirements and changes that have occurred to employment as a whole. Several proposed changes have been put into the works, with most of the employment changes occurring in April 2014. Is Independent Say the Way Forward for the UK Government? The United Kingdom maintains its roots of government, but perhaps it is time for some major changes to occur. Northern Ireland, Scotland, Wales and England all have a say in the UK government, but is there fairness in the representation? Read more about Is Independent Say the Way Forward for the UK Government? In review, 2013 proved a mixed year for UK law jobs. Against a backdrop of the planned changes to Legal Aid provision and personal injury law and regular news of law firms falling into administration – particularly at the mid-tier level – there was generally felt to be more optimism about law job prospects and salaries than has been felt in the previous three or four years. The Institute of Legal Secretaries and PAs offers a variety of popular distance learning courses which will help you to advance your legal knowledge and skills. Our Legal Secretaries Diploma and Single Subject Legal courses are studied by thousands of Students throughout the UK and overseas. If you can minimise nervousness in the run-up to your interview, you’ll be in a good position to perform well on the day. It’s worth remembering, though, that a few nerves and being under a little stress can be good for you, according to the latest medical research. Being under slight stress is likely to fire you up, make you more alert, able to tune out distractions and think creatively – all great aids to an impressive job interview! This month we are looking at some of the latest developments in the world of wills and probate. 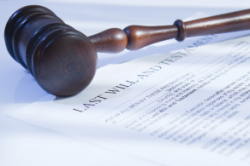 A new protocol published in July 2013 was linked to the Law Society’s Wills and Inheritance Quality Scheme. The protocol is not currently compulsory for Solicitors unless they are members of the Quality Scheme.